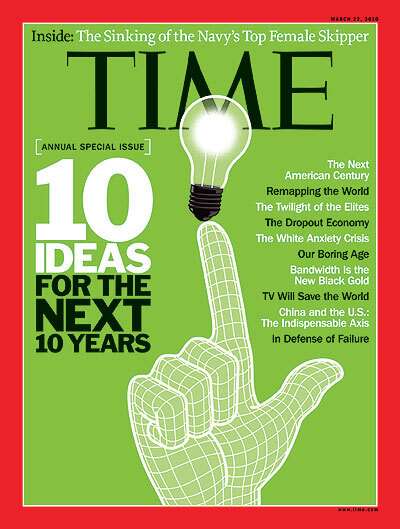 Home › Blogs › Joanne Poyourow's blog › A Vision of Transition -- in Time Magazine! A Vision of Transition -- in Time Magazine! Okay, I don't usually read Time Magazine. In fact I can't remember the last time I picked one up. But a friend handed me a copy of an article from their March 22 issue. I was astounded to read a vision of the future which is not altogether different from the visions we hear through the Transition network. It's part 4 of a "10 Ideas for the Next 10 Years" section: "The Dropout Economy: The Future of Work Looks a Lot Like Unemployment." "As industrial agriculture sputters under the strain of the spirialing costs of water, gasoline and fertilizer, networks of farmers using sophisticated techniques that combine cutting-edge green technologies with ancient Mayan know-how build an alternative food distribution system." Did you catch that inkling of peak oil in there?? "Private homes will increasingly give way to cohousing communities, in which singles and nuclear families will build makeshift kinship networks in shared kitchens and common areas ..."
Mainstream media is starting to do our work for us! "It's important to keep in mind that behavior that seems irrational from a middle-class perspective is perfectly rational in the face of straitened circumstances." "The decision to turn away from broken and brittle institutions, like conventional schools and conventional jobs, will represent a turn toward what military theorist John Robb calls 'resilient communities,' which aspire to self-sufficiency and independence." And they portray it on a hopeful note. "the millenial generation could prove to be more resilient and creative than its predecessors, abandoning old, familiar and broken institutions in favor of new, strange and flourishing ones." "Somewhere in the suburbs there is an unemployed 23-year-old who is plotting a cultural insurrection, one that will resonate with existing demographic, cultural and economic trends so powerfully that it will knock American society off its axis."